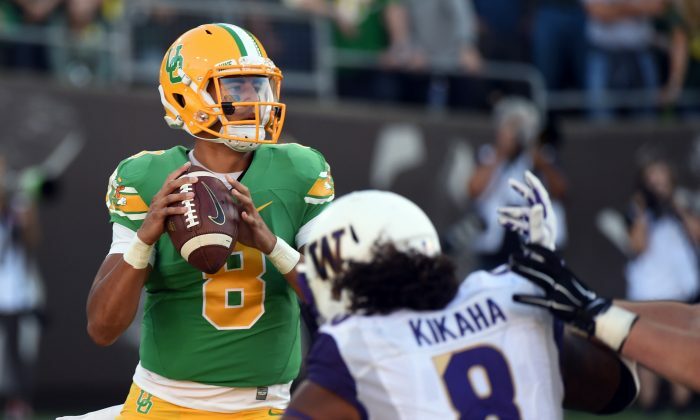 On the Ball: Heisman Watch—Is it Mariota’s to Lose? White jumped into the Heisman race after recording 100-plus yards receiving in each of his first seven games of the season. The streak was finally broken Saturday in a 34–10 win over Oklahoma State when he was held to just 27 yards on three catches, though he did score once. Although Winston’s off-the-field troubles have grabbed more headlines than his on-the-field theatrics, the reigning Heisman winner has the third-highest completion rate among qualifiers and he’s been especially good in his last two outings—resulting in wins over Syracuse and Notre Dame. In addition, he has his undefeated Seminoles in the playoff race. Cooper went for 225 yards receiving in the 34–20 win over Tennessee and is now second in the country in total receiving yards. It also marked the sixth time in eight games that he went for 130 yards or more. As long as Alabama stays at one loss and Cooper keeps notching 100-yard games, the junior wideout has a shot. Gordon, who’s fourth in the NCAA in rushing yards, has run for 120 or more yards in six of seven games. Ironically his worst performance (38 rushing yards on 17 carries) came in a 37–3 win over lightly regarded Western Illinois back on Sept. 6. In the five games since then he’s averaged a staggering 198 yards and 3 touchdowns per. Prescott makes this list largely because he’s quarterbacked the surprising Bulldogs to the top of the college football world—and doing it in the ridiculously tough SEC West. Individually, his 156.5 QB rating is 16th best in the country and he’s thrown for 200 or more yards in every game. Abdullah, who is currently first in the nation in rushing, is coming off a 225-yard performance in the 42–24 win over Rutgers—his fourth 200-plus yard rushing game of the season. Of his 19 total touchdowns, 17 are via the ground game—second in the country—and he has at least one in all eight games. Abdullah has four regular-season games left and would need to average 188 yards per game to get to the magical 2,000-yard mark, which would be tough for voters to ignore. Mariota threw for 326 yards and five touchdowns in the 59–41 Friday night win at California, but finally threw his first pick of the season—in 218 total attempts. Mariota continues to lead the country with a 192.2 QB rating and the dual-threat weapon is second on the team with 325 yards rushing. As long as keeps putting up these numbers and his 7–1 Ducks keep winning, Mariota should bring home the hardware.